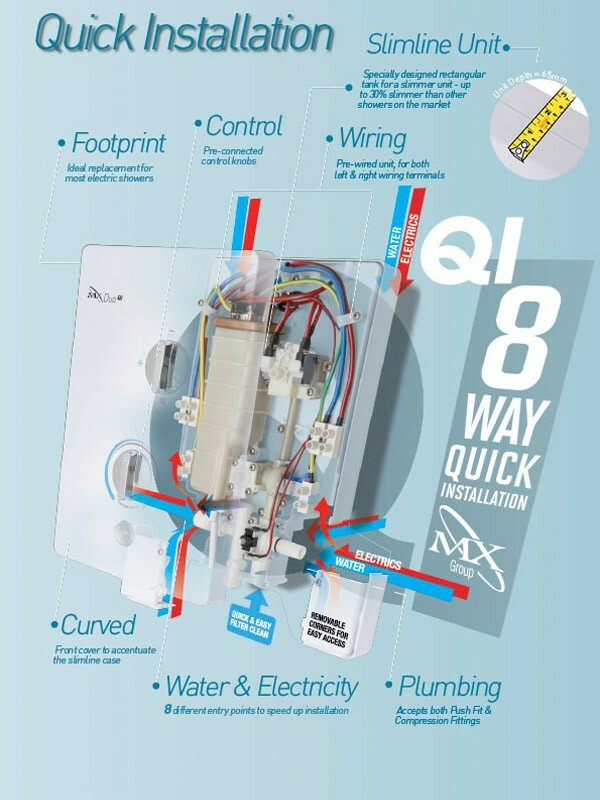 The MX GCE Duo Quick Installation 7.5kw is a powerfully slim and stylish shower, and comes available in 7.5kW, 8.5kW and 9.5kW. Its attractive design is guaranteed to complement any bathroom and will meet your requirements without compromise. Features include full temperature stabilisation, 2 eco settings and safety high temperature cut out. The MX Duo QI Replaces the MX Duo LX and LXI Showers with left and right hand water entry and the Mx Neptune Exotic Electric Showers. The MX Group manufacture and supply product to the highest quality standards, through innovation, excellence of service and value. Mx Products come with a minimum of 1 year guarantee. Many of their products have extended guarantees some with onsite support. Details of this are below. 1-10 Year Guarantee - Please call 0845 505 2211 if you encounter problems with your MX Shower Enclosure. Please check the MX Website for your products warranty information. 1 Year guarantee - Please call 01502 440232 if you encounter problems with your Intro shower. Applicable to the UK Only - not ROI. Buyaparcel offer delivery throughout the United Kingdom, including Northern Ireland, Scottish Highlands and other Islands of the UK. In addition we can now also deliver through Europe. Belgium, Germany, Luxembourg, France, Netherlands, Rep Ireland. Austria, Denmark, Czech Republic, Poland, Lithuania, Hungary. Estonia, Spain, Sweden, Italy, Portugal, Latvia. You also now have the facility to choose a day you wish to have your order delivered on if your order is being delivered via courier or pallet. This can be done at the checkout stage where you will be shown a calendar if you select the book in option. You will have the option of booking in your delivery for a day that is convenient for you. Should you require the order the following day please select the next day option. Is My Item Available for Next Day Delivery? If your item is stocked in our immediate picking location it will available for you to choose a next day delivery. This will be highlighted by a green tick and a 1 day dispatch time on the item information. You will have the option to choose this service if you are purchasing your item for delivery to mainland UK. What courier will my item be delivered with? If your item is being delivered in the UK or Ireland, it will be delivered by UK Mail or Royal Mail, with the exception of pallet items. The courier type is displayed on each item but will be confirmed at the checkout stage when you have completed your shopping. If you are an international customer, your goods will initially be sent via UK Mail, and then exported to either Eurodis or DHL. The appropriate tracking can be provided when necessary. Details of each courier service we offer are detailed in our Delivery Guide. How do I track my delivery? To track your order online, go to 'Your Account' and click on 'Purchase History' for an update on your order. Our team work extremely hard to get your parcels to your door in the shortest possible time but please note that we recommend you do not book a plumber etc until you have received and checked your goods. Delivery addresses cannot be changed once the order is placed except in the case of an error, which we will do our best to change, but orders are often shipped quickly after being processed. The couriers we use do not deliver to PO boxes or building sites. We've simplified our returns process! We now offer a no-questions-asked, free returns service within the first 30 days (subject to T&Cs). You can find our returns information in our Terms and Help page.